Robert Wayne “Bobby” Ashworth, age 74, of Nashville passed away Friday, January 19, 2018. He was born April 20, 1943 to the late Douglas Ray and Mamie (Smith) Ashworth. Bobby was a true son of the Nations who enjoyed cars, motorcycles and life. His family remembers him as a great brother and son. He attended Cohn High School in Nashville and joined the United States Navy at a young age. 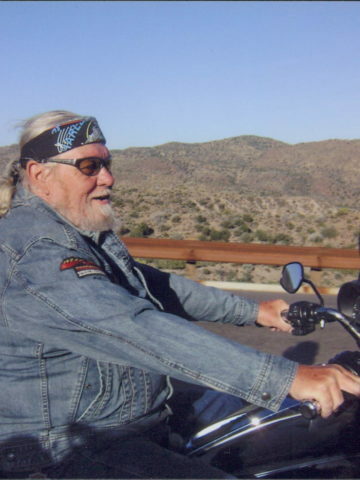 He was a skilled motorcycle and automobile mechanic. Bobby’s favorite past times were motorcycles, fishing and family. Bobby is survived by his brother and sister in law, Ray and Gail Ashworth; son, Bobby Ashworth; grandson, Dustin Ashworth; aunts, Geraldine Steele and Joyce Spicer; a host of cousins and friends; and his beloved dogs, Izzy and Bo who were faithfully at his side. A memorial visitation will be held from 3-6 p.m. Monday, January 29, 2018 at West Harpeth Funeral Home. www.WestHarpethFH.com. In lieu of flowers donations may be made to Nashville Humane Association 213 Oceola Ave. Nashville or St. Luke’s Community House, 5601 New York Ave., Nashville 37209. Sincere condolences to the family and friends. I know that Bobby will be dearly missed. Please know that our Heavenly Father wants you to be comforted at this difficult time. The promise in 1Thess.4:13,14 is of comfort, knowing that those who have “fallen asleep” will awaken soon. Through prayer and meditation, I hope you find real hope and strength. I’m sorry for your loss.